weedend: WYDII (With Your Destiny II) is opening its Closed Beta World Server this month (April).ill inform you guys later to where you can download and play the game for free.see you online..
seijyuro: anyone know whr can i dl rapplez? Aramis: Been playing Eve Online almost three years, they keep adding content and it is so good my wife says the game goes or she does... darn I am going to miss her! blueorblack: So is RF Online very popular here??? 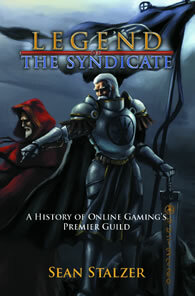 MMORPG Gamer interviews Sean Stalzer aka Dragons about his first book, Legend of the Syndicate. For those who didn't know, The Syndicate has been in existence since 1996 starting out even before Ultima Online. Today The Syndicate is one of the biggest guild with over 500 members worldwide. Gamer: Dragons, your book really impressed me. I didn't know that there are guilds out there that has lasted so long. It really makes me feel like I want to join a guild such as yours after reading the book. Dragons: Im glad you liked the book :) A guild like mine is one of a kind, hehe, so its easy to get lost in a gaming universe of millions of gamers each saying they are the best, for the short time they are around. Gamer: Are there plans for The Syndicate to move into a new game? Dragons: There are always things in motion to look at future games. We participate in the beta testing of basically everything that comes out. We have some very formalized testing relationships with some companies where we get really in depth and get involved very early on. We tend to have members playing just about every game out there. We only recruit for 2 major games at a time which are currently UO and WoW. But yes, we will most definitely establish a massive presence in a new game in the future. That is the nature of the online world. Gamer: If there are, what type of games and what criteria do you look for? Dragons: While we do help test every type of game out there and while our members do participate in every game, we primarily focus our major guild presences in Fantasy themed MMOs. We do have a great number of criteria that we use to pick games we go to and we cover the considerations in our book that we feel are important in the current Era of MMOs. For example, instancing of end game content we feel is very important. Communities thrive more readily when each one can manage their own path through content at their own pace and in their own way. Gamer: How many people in The Syndicate that are not in the United States? Dragons: 80 to 85% of our guild is in the United States. We do have a large number of Canadian members. We also have a fair number of European members. We have some from other countries as well like Australia. We, of course, have several deployed to Iraq that game with the guild from there as well. Gamer: Do you have plans for having The Syndicate World Conference outside of the United States? Dragons: Our Conference last year was in Canada so technically speaking we have already done that :) It would be nice to do one in Europe. The challenge is that with the bulk of the guild in the US, and since the goal of the conference is to grow and enhance friendships, getting as many people to the event as possible is what we try to do. The further away from the US we go, the more it costs and thus less people can go. With the added passport requirements that just complicates the logistics even more. So for the time being I think the next few conferences will be in the US. Gamer: How has your first book changed your life? Dragons: I wouldn't say that the book has changed my life at all because the book isnt about me. On the one hand, it is about several hundred really great people and their efforts to make a virtual community like no other. On the other hand, it is about the online gaming industry and how it has evolved over the years. I hope it changes both of those for the better in some small way. I personally have been most affected, in a positive way, by the comments and feedback from dozens of my guildmates who read the book and took away from it a deeper understanding of our team and why we are what we are and how we got there. That, for me, was more than enough reason to write the book. Gamer: How did your manuscript happen to be published by Avari Press? Had you sent it out much before that? Dragons: Avari approached me about writing a book. Ironically, I had already begun work on the outline for a book that I planned on writing for our guild. When Avari approached me about writing a book I started with that outline and expanded the focus of the book to make it a worthwhile read for all gamers and not just Syndicate members. I was pleasantly surprised when they did contact me and working with them on the book has been a great experience. They allowed me full control over the content and the flow and supported me the entire way through the process. Gamer: Were you involved in designing the cover? Dragons: The cover art is a design I came up with. We commissioned an artist out of Hong Kong that does all of our core guild artwork and he turned that idea into the picture that you see on the cover. The general idea of the picture is that a Syndicate general and his archmage advisor are on a hill overlooking a city. The Syndicate army is mustered on the plain below advancing on the city. Dragon riders fly above raining fire down on the defenders. Catapults fire. Arrows fly. Spells leap out at the city. The city is doomed. You can feel it in the air. Gamer: What do you remember about the day when you saw your finished book for the first time? Dragons: That day wasn't too long ago. I had been staring at the words on a computer screen for months. We began work on the book about a year ago. It didn't take long to right since I had much of what I wanted to say formed in my head already. But months of tweaking and editing and adjusting went on. Then there is, from the author perspective, this period of time when nothing happens. In reality the publisher, printer and distributor are all doing their magic to take the computer file and a picture and turn out the final product. Seeing the final book was a very proud moment since, while it did represent a great deal of my time, it also represented immortalizing the stellar achievements of several hundred great people who call themselves The Syndicate. It is really their book and I know I speak for the entire guild when I say they were immensely proud to finally see it in print. The only regret I have is that during the time it was being written, we sadly had two more of our members pass away but it was too late to get them onto the "In Memory Of" page before the first edition was printed. Gamer: What have you been doing to promote the book and what are those experiences like for you? Do you enjoy reading publicly? Dragons: So far the book promotion has been limited to interviews and reviews. Podcasts and written reviews are the primary ways to promote a book on the web. It has been a good experience so far because the book has been well received so far. When you write something and put months of effort into it, you naturally think you did a pretty good job. The real measure is how those that matter to you feel about it and they too felt it was well done. But an important factor is how independent reviewers feel about it. So far, all the independent reviews and feedback we have received have all been very favorable. Gamer: What was the best advice you got? What advice would you give someone who is about to have a first book published? Gamer: What advice do you have for MMORPG gamers out there that are looking to join a guild? Dragons: Guilds exist for a variety of purposes. Players join guild for a variety of different reasons and with a variety of different expectations. Take some time to look over your options and pick a guild who's path matches what you are looking to achieve. If you join a guild looking for long term friends and you are just looking for short term pixels, that doesn't benefit you or them and you will both end up unhappy in the end. If you want a long term home but a guild invites you without so much as a second glance, they probably dont have themselves very well thought out and probably wont be around long term. There are lots of considerations when picking a guild. Take your time and find the one that best matches what you seek from gaming. Dragons: If you meet the requirements we talk about in the book, absolutely! Those are how we decide which of the 4,000+ applications that we receive each year get to join. One of the core reasons we are so successful is that we have very strict recruiting standards that we make no exceptions to. That means that all of our members are similar in personality, play styles, goals etc... and are all looking for the same things out of the guild. Gamer: Of course :) Thanks for taking the time to tell us about your new book, Legend of The Syndicate and also about your guild. Dragons: Thank you for taking an interest! You have an outstanding site that definitely helps the MMO community remain strong. You can buy the book Legend of the Syndicate from http://www.avaripress.com/books-authors/legend-of-the-syndicate. All logos, trademarks and news in this site are properties of their respective owners. The comments are properties of their posters, all the rest © 2005-2007 by MMORPG Gamer.